All tests were taken using an ADATA Class 6, 16GB SDHC memory card, Program Mode, ISO auto, Flash off and all other settings at the factory defaults unless noted otherwise. Nikon's CoolPix P500 is an incredibly versatile and fun camera to operate. Sporting a 36x optical zoom lens, 12.1-Megapixel Backside Illuminated CMOS, 3.0-inch LCD and 1080p HD video capture this camera is capable of more than just fun. Its overall image quality is a concern and may lead you to look at other Mega-Zoom models. ...You are looking for the the biggest zoom range and list of creative and powerful features that you can find on a point-n-shoot digicam under $400. Nikon's CoolPix P500 has gone above and beyond in the world of Mega-Zoom digicams. Introducing its 36x Nikkor optical zoom lens, it has surpassed everyone with its amazing range. Assisting this incredible zoom lens is a 12.1 backside illuminated CMOS imager, sensor-shift image stabilization, Full 1080p HD video capture, a 3.0-inch Vari-Angle LCD screen and a full set of automatic and manual controls that will satisfy the needs of most any photog. To give the camera more of a dSLR feel, Nikon has added a second zoom control on the side of the lens, allowing you to zoom with your left hand while you support the lens. With all of these great features, Nikon has still remembered the people who are just looking to point-n-shoot as well. With an auto mode and an auto scene selector mode, anyone can pick up the camera capture beautiful images without having photography background. Fitting perfectly into your hands, Nikon has done an excellent job with the shape and layout of the P500's grip surfaces and controls. Both the EVF and LCD are easy to use while shooting, giving you the same feel as a dSLR. The shutter release, command dial and side zoom control also allow you easily operate the camera without having to take it away from your face. Even the dedicated movie record button and mode switch can be operated without looking with just a little practice. With a simple layout of controls on the back, you will have no problem navigating the menus and making your selections. While the EVF, with approx. 200,000 dots of resolution, provides a good option from framing your images, it is also a great way to shoot in tough lighting conditions. If you are looking for the best resolution, you will want use the 3.0-inch Vari-Angle LCD screen. With 920,000 dots, this screen will show you even the finest details. The screen also pivots up and down to allow you to shoot around objects or adjust the angle to remove glare from the screen. Looking at our outdoor image samples, all of the images are very bright, with several instances of overexposure within them. Some of these come while the camera was exposing for a face, which is expected in some cases, but the P500 does it a bit too much. Since these images are so bright, they also seem a bit washed out, dulling the color and preventing the images from really blowing you away. On top of the overexposure, there are a few instances of aberrations as well as some edge softness to deal with. On the other hand, the images are crisp in the middle, showing a great deal of detail. There is a little bit of noise in the darker areas of the images, but this is only noticeable when you look at the images at 100%, and won't show up in your average sized prints. The 36x optical zoom lens provides a versatility outside that you will not find on any other camera. With a 35mm equivalent of 22.5-810mm, this lens gets a little bit wider and a little bit closer than any other camera out there. Looking at our indoor sample images, we see a good exposure with descent color (just a little warm using auto white balance). As we look closely at the image, there is a bit of noise throughout, which softens the image just a bit; which can be seen even at ISO 160, which is the lowest setting available. As the ISO goes up, there is little increase in the amount of noise, until you reach ISO 1600 where the image really starts to lose detail quickly. Assisting with your indoor and low-light images is a small but somewhat powerful pop-up TTL flash unit. With a range of up to 26ft. (W) and 14ft. (T) at ISO auto, you will be able to light a medium sized room, even using the mid-telephoto end of the zoom to tightly frame your subject. Nikon's face detection software on the P500 works very well when it comes to detecting and tracking faces within the frame. It did pretty well when it came to adjusting the camera settings, based on the detected faces. This keeps the faces in focus, but it also what causes most of the over exposures in our portrait samples. Again the images are washed out, taking away a from the skin tones as well as the background colors. Capturing video with the P500 is simple, just the one push of the button and the camera starts recording, no matter what shooting mode it is currently in. With the capability to capture 1080p HD videos or lower quality, high speed videos, you have a powerful and creative tool at your fingertips. Our sample movie shows how well the camera is able to keep focus with a moving object, as well as its ability to zoom while recording. The movie itself plays back very smoothly, even with the quick motion and fast panning to follow the plane. The stereo microphone had no problem picking up the plane flying by but it will have a little more trouble with sound in the distance that isn't so loud. You have the ability to play your movies back on the camera, computer or TV/HDTV by using the correct cables. Powering the P500 is a 3.7V, 1100mAh Li-Ion rechargeable battery. During our tests, we were able to capture 160 images and movies while completing our tests. This comes very close to the 220 images that Nikon claims are capable from a single charge of this battery. While the battery lives up to the claims from Nikon, 220 images is a little short for a battery, so you will want to have a spare on hand at all times. This can be a little difficult since the battery charges inside the camera and not with a portable charging unit. However, it will still be worth your efforts to have a spare, especially on a long trip. 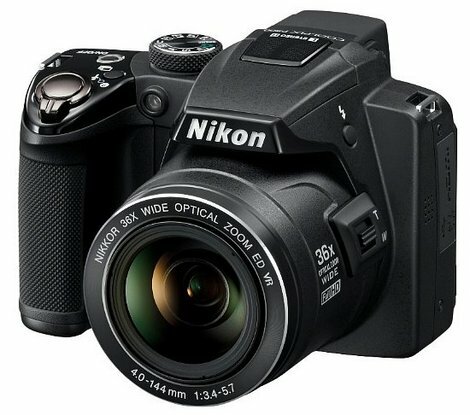 Bottom Line - Nikon's CoolPix P500 sports an amazing 36x optical zoom Nikkor lens with sensor shift image stabilization, a 12.1-Megapixel backside illuminated CMOS imaging sensor, 1080p HD video capture and a high quality 3.0-inch Vari-Angle LCD screen. While this makes the camera one of the most versatile camera's available, its image quality is lacking. Because of this you might want to look at one of the other Mega-Zoom cameras on the market like the Fuji FinePix HS20EXR or the Canon PowerShot SX30 IS. The P500 has a MSRP of US$ 399.95, which is a competitive price for a camera in this Class. While the features and versatility are great, the image quality is something that needs considered.